I'll admit I've never been a big sci-fi reader. Sci-fi movie watcher, yes, but I tend to get lost in technical descriptions and battle scenes. But I've recently discovered that the problem is my definition of sci-fi. I've been lumping everything together with hard sci-fi. There are a plethora of sub-genres, though, including the one Grace Bridges' Legendary Space Pilgrims falls under: cyberpunk. For those of you who don't know what cyberpunk is, Wikipedia says that its focus is "high tech and low life"--"advanced science...coupled with a degree of breakdown or radical change in the social order." That's Legendary Space Pilgrims for sure. Planet Monday is "high-tech" but uses "low life" ideas such as slavery and government control of emotions. The social order is definitely topsy-turvy, as people are forced to labor day in and day out, and any upswing in emotion sends them off to be mindwiped. However, one slave--Mario--is visited by a Voice that speaks of hope and escape from the oppressive Planet Monday. He convinces Caitlin, a fellow slave and the woman he loves, to join him. After their escape, they experience the real story--their own personal journeys to emotional freedom. This is my second trip into the mind of Grace Bridges. I read Faith Awakened a few months ago, which has more of a literary feel. 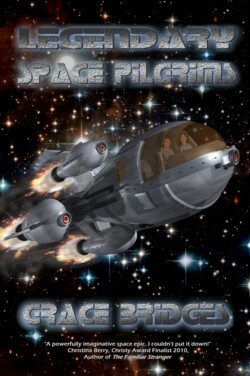 But Grace stays true to her strengths in Legendary Space Pilgrims, offering a well-paced, character-driven story that will get you thinking about your own journey with God. Visit Splashdown Books for more info and to purchase Grace's books. This sounds like a cool book. Many people in Modern society seem to associate technical advances with advancements in societal well-being. Good to see someone sees that people are just people and will always be so and that technology is just a tool to be used for good or ill. Unfortunately, someone always finds a way to use it for ill.